About Us – Hi-Line Electric, Inc. 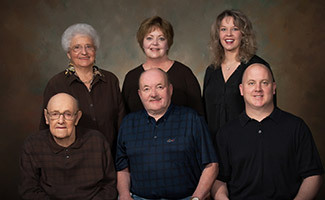 There is no doubt that Hi-Line Electric is a family business; in fact, 3 generations of family. Perry Grotberg began an electrical business in his Valley City garage in 1948. In time, his oldest daughter married one of his electricians, Bruce Anderson, and in 1987 they began Hi-Line Electric. Bruce and Amy’s daughter married one of Bruce’s electrician’s, Chad Zaun, and now they are co-owners of the business with Bruce and Amy. Bruce Anderson began wiring in 1968 and by 1974 he had obtained his ND Master’s License. He formed Hi-Line Electric in 1987 and in 1996, Chad Zaun came to work for Bruce. Ultimately, Chad received his Journeyman license in 2001 and Master’s license in 2008 and became a co-owner with Bruce. Hi-Line Electric has built a reputation on a wide range of quality work including residential, commercial, industrial and agricultural projects. For our customers, this is a reflection of how the employees of Hi-Line Electric approach each and every job. The company has a philosophy of providing quality competitive electrical contracting and service to our customers. We welcome the opportunity to give estimates on smaller projects and bids on larger ones.